These are lyrics by The 5th Dimension that we think are kind of repetitive. 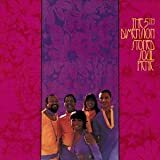 The 5th Dimension's, "Aquarius/Let The Sunshine In"
It's fun to sing about three times. Then you listen to them repeat it about seven more times.